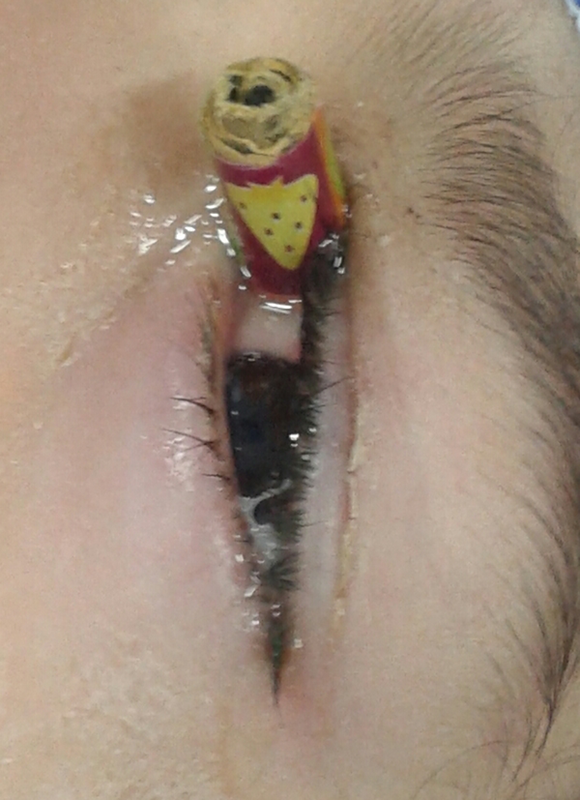 To Cite: Torabi H, Tabatabai S. Intraorbital Penetrating Pencil Injury in a Child, Trauma Mon. 2017 ; 22(4):e34641. doi: 10.5812/traumamon.34641. Introduction: Intraorbital penetration caused by foreign bodies can lead to blindness or even death following concomitant intracranial damage. Case Presentation: This study reports a three-year-old girl whose left orbit was penetrated by a long pencil. The penetration did not cause any ocular or neurological damage. Conclusions: A computed tomography (CT) scan is the key imaging study for diagnosing the location and the extension of a foreign body. In this case, it indicated a hypodense object with a high-intensity core that is compatible with the wooden and carbon parts of a pencil, respectively. The pencil was removed easily under general anesthesia and without complications. Ocular trauma causes blindness in approximately half a million people worldwide (1, 2). Intraorbital foreign bodies are found in about one in six orbital injuries (3). Intraorbital foreign bodies can damage the orbital contents or intracranial tissues and may lead to infection (4). In this study, we investigated a CT-scan appearance and surgical approach to the intraorbital foreign body (a pencil) that penetrated a child’s left orbit. The parents of a three-year-old girl were referred to our clinic in March, 2015. According to them, a pencil went directly into the left orbit of their child when she fell down. Physical examination showed no damage to the anterior or posterior segment of the child’s eye. She did not cooperate with visual acuity or intraocular pressure measurements. The pencil had entered the orbit just adjacent to the medial cantus (Figure 1). There was some ocular motility limitation and no RAPD. An orbital CT-scan was performed and disclosed a hypodense object with a high- intensity core that matched the wooden and carbon parts of the pencil, respectively. It was extended to the orbital cone and superior orbital fissure (Figures 2 and 3). Surgical treatment took place the same day of the accident. The surgical procedure started with the attendance of a neurosurgeon. After general anesthesia and washing of the fornices with 5% povidone-iodine, a limited peritomy was performed, and the pencil was removed from the orbit. No antibiotic irrigation of the surgical wound or drain was used. There was no cerebrospinal fluid (CSF) leakage. A complete ophthalmic examination was performed under general anesthesia, and no ocular abnormalities were detected. Topical chloramphenicol 0.5% eye drops and erythromycin ointment were administrated for one week after surgery. Neither systemic, oral, or IV antibiotics were used in the pre-operative or post-operative period. The patient was followed up for three months after surgery, and during the follow-up period, no ocular or neurological damage was noted. Orbital walls are very thin in children, and any low-velocity penetrating foreign body can fracture them (5). Penetrating foreign bodies most often penetrate the orbital roof (6). The second most common path of injury is via the superior orbital fissure because the bony anatomy of the orbit directs the low-velocity foreign body toward the superior orbital fissure (7). Objects penetrating the superior orbital fissure are directed towards the cavernous sinus, under the frontal lobe, medial to the temporal lobe, above the petrous ridge, and lateral to the brainstem (8). Therefore, the penetrating low-velocity foreign bodies may produce life-threatening injury because of cavernous sinus and/or brainstem damage (9). Due to the risk of intracranial penetration, removal of the foreign object should be deferred until sufficient imaging is performed (10). Unenhanced CT-scanning is the key imaging method for the diagnosis of such damages (11). The surgical approach is based on the location of the foreign body, its penetration pathway, and associated intracranial complications (12). Under general anesthesia and preparation with 5% povidone-iodine, we performed a localized peritomy and then pulled the pencil out easily. No CSF leakage occurred. During the follow up course, no ophthalmic or neurological abnormalities were identified. The interesting aspect of this case was that although the large foreign body penetrated the orbit and superior orbital fissure, it was removed without any ocular or brain damage. 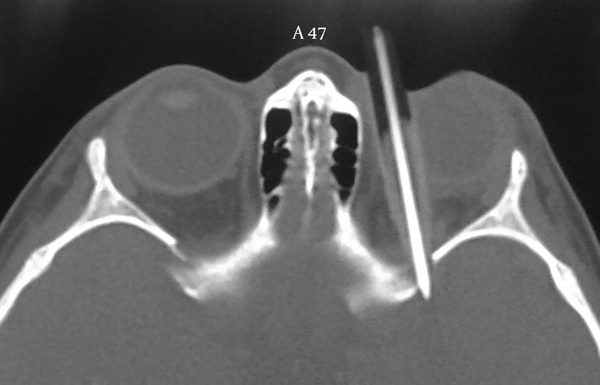 Moreover, the CT appearance of the pencil as an intraorbital foreign body is interesting in and of itself. It demonstrated the low density values of the wood and the high density values of the graphite center of the pencil. A pencil can penetrate the orbit and extend to the intracranial tissues. It appears as a hypodense object with a hyperdense central core in CT-scan images. In this case, the large foreign body (pencil) penetrated the orbit without any ocular or cerebral damage. We thank our colleagues from the emergency department of the Farabi eye hospital, who provided insight and expertise that greatly assisted our research. Authors’ Contribution: Study concept and design, interpretation of data, drafting of the manuscript, critical revision of the manuscript for important intellectual content, Hamidreza Torabi; study supervision, Seyed-Ali Tabatabai. Financial Disclosure: None of the authors have any financial or conflicting interests or funding sources to disclose.